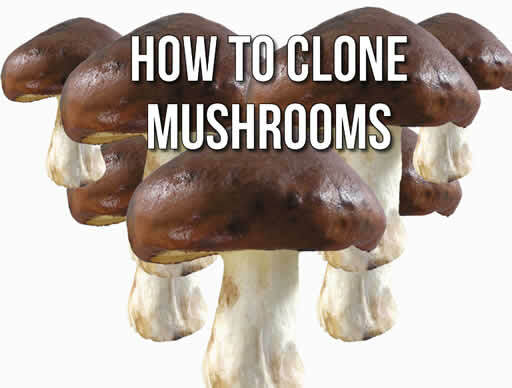 How To Clone Mushrooms. Growing your own shrooms is a great way to have a continuous supply without looking for them. To clone mushies you need to understand a little bit about how it works. Here is a micro lesson in fungal genetics and biology. When you order your mushroom spores, you are ordering a variety of shroom, not a strain. They are often labelled as magic shroom strains, but this is a mistake. When the spores arrive in a syringe, a vial or on a print, or whether you use dried or fresh shrooms, they’re all from the species Psilocybe cubensis. When the spores find each other, they try to mate. You can mix the spores from the same species to create a varietal hybrid. When two spores mate with success, this creates a strain. They’re an endless number of strains within varieties. Some are high in psilocybin and other do not contain much. When you start with mushroom spores, you have 100s of strains. Every mushroom grown can be made up of one or more strains. To clone your legal mushrooms, take part of the mushroom’s inner tissue to grow in the environment you set up. It is simple to clone your mushrooms. All you need is some cardboard, a half pint (240 ml) jar, a coffee filter, a petri dish, a sterilized razor blade and some isopropyl alcohol. Cut a small piece of cardboard, around 1 x 1-inch square. Separate the smooth sides of the cardboard to expose the internal ribbed surface. They may not separate cleanly. Clean off the excess fibers left behind on the ribbed surface. You do not want to leave these here as they can interfere with your cloning. Fill a half pint (240 ml) jar with a water. Inset the prepared cardboard piece into the jar and put into the microwave. Microwave on full so it boils for 10 to 15 minutes. Let it stand to cool in the microwave oven. Put an alcohol-soaked coffee filter over the top and secure with a rubber band. This is to protect it from contaminants while you move it. Note: Microwaving in this way sterilizes the cardboard and speeds up the hydration process. It also removes most of the glue in the cardboard better than any other method. Take a piece of your mushroom. You can cut a piece from the stem or the flesh from the mushroom cap. Rip open the mushroom cap and cut a piece from the thick part between the top of the mushroom and its gills using the sterilized razor blade or a knife. Note: Make sure you do not take any of the surface material or gills of the mushroom. These areas contain bacteria and contaminants. Put the cardboard into a sterilized petri dish. Take the mushroom tissue and push it forcefully into the ribs of the prepared cardboard. Make sure there is maximum contact between the mushroom sample and the cardboard. Wipe out the half pint with isopropyl alcohol to ensure it is sterile. Put the cardboard impregnated with the mushroom sample back into the jar and seal it with the plastic lid. Note: Make sure throughout this process to keep everything sterile for the best results. Repeat the process for as many clones you want to grow. Place the jars in a dark, warm place and do not open them. After a few days you will see the mycelium become fuzzy and start spreading throughout the jar. This should take from between two and three weeks. Do not open the jars during this time. Regularly check for signs of contamination. Signs include black or green mold growing in the jar. If this occurs, start again and be more careful about the sterility of your working environment. Once the mycelium reaches the edges of the jar it is ready to use. Or, store the magic mushie clones upside in the refrigerator ready for use. Now you know how simple it is let us know the results of your grow.